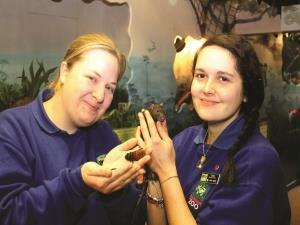 Educational Visits at Banham Zoo01953 715311work Educational VisitsAward-winning attraction. Enjoy the ultimate fun filled day out at one of the country's most exciting wildlife attractions. Get your group up close to some incredible animals! These 45 minute hands on sessions with reptiles, insects and small mammals bring the curriculum alive! We offer a wide variety of topics from a basic animal encounter to feeding, habitats, camouflage, babies, growth and classification. Available for KS1 to 4, GCSE and 16+ groups. We also run fantastic discovery sessions for rainbows, brownies, clubs and scouts. OPENING TIMES: Open daily from 09.30. Award-winning attraction. Enjoy the ultimate fun filled day out at one of the country's most exciting wildlife attractions. Get your group up close to some incredible animals! These 45 minute hands on sessions with reptiles, insects and small mammals bring the curriculum alive! We offer a wide variety of topics from a basic animal encounter to feeding, habitats, camouflage, babies, growth and classification. Available for KS1 to 4, GCSE and 16+ groups. We also run fantastic discovery sessions for rainbows, brownies, clubs and scouts. Free preliminary visit for teacher, teacher and pupil resource packs, qualified schools guide/specialist education officer on hand, outdoor eating area available. Please visit our website, or telephone Guest Information for educational rates.